Uncle Pennybags and Go to Jail! 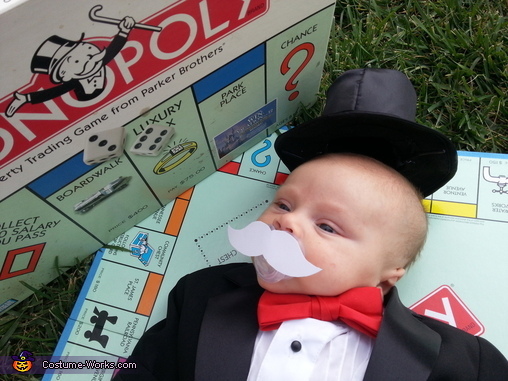 Our baby Camden, 6.5 weeks old, is celebrating his first halloween as Mr. Monopoly. Camden looks like a little old man, like all babies, so we thought what little old man can we dress him up as. Benjamin Button wasn't really distinct so we came up with Mr. Monopoly. We used a baby sized tux and a red bow tie. We got a mini top hat from Claire's and stripped it of all girly stuff. We glued a cut out of a mustache onto a pacifier and made a cane out of a paper towel tube. brilliant. the parents must have good genes.